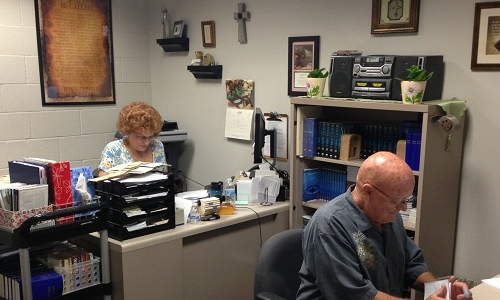 Religious & Volunteer Services (RVS) was created to administer the Jail Chaplaincy Program. This program coordinates all religious activity within the jails and ensures that inmates have access to ministers and spiritual advisors of their preference. Assisting RVS in this task is the Religious Advisory Council. This is a group of several liaison chaplains, representing the Christian, Catholic, Protestant, Buddhist, Orthodox Jewish, Reform Jewish, Armenian Orthodox, Eastern Orthodox, Islamic, Christian Science, Latter Day Saints (Mormon), Anglican, Jehovah's Witness and Episcopalian faiths. This group assists with the oversight of religious programs, working closely with the RVS office to resolve conflicts, deal with custody issues, and ensure that each inmate receives requested spiritual support. The Jail Chaplaincy Program now includes 290 ordained or licensed chaplains and 1,500 religious/spiritual volunteers representing eight major faith groups and numerous sects. All chaplain services, worship services, scripture study programs, spiritual counseling, death notifications, hospital notifications, 12-Step assistance for inmates are performed by volunteer staff and clergy RVS works with different custody facilities to coordinate special religious events, such as Ramadan observance, Passover, and Christmas. They also work closely with the Food Services Unit to provide for any special dietary needs. The founders of the Alcoholics Anonymous Organization developed the 12-Steps Program, which offers simple, straightforward guidance to men and woman hoping to lead sober lives. As guides to recovery, the program emphasizes the relationship between spiritual assistance and recovery. Many inmates have successfully utilized the 12-Step Programs found in both Alcoholics Anonymous and Narcotics Anonymous. The custody jail programs follow the same basic guidelines and principals that are practiced by recovering addicts outside of jail, as well as providing further support once released from jail. Written materials, spiritual support, small-group work, mentoring, and counseling are included in this program. This program follows the principles outlined in the book, "A Purpose Driven Life," written by Rick Warren and is provided to inmates at the Men's Central Jail. Customarily, self-help books suggest that people should look within at their own desires and dreams. Rick Warren believes that success begins with God and by understanding his eternal purpose for each life. Furthermore, that real meaning and significance come from understanding and fulfilling God's purposes for putting us on earth. The family outreach program assists the families of inmates with spiritual and religious concerns and offers referrals to 12-Step Programs, churches, free legal services, spouse/child abuse programs, food programs, crisis intervention, parenting classes, and financial services that are available in their communities. They also assist the Sheriff's Department in dealing with the large volume of visitors who arrive each visiting day. These volunteers help improve services and increase the level of understanding between the Sheriff's Department and the public. They query names in the jail computer system and provide booking numbers and locations of inmates. They also give directions and maps to other facilities within the Los Angeles County jail system.